Plus, Romelu Lukaku to be first goalscorer in Everton-Middlesbrough. 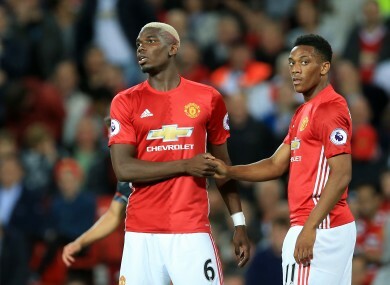 Manchester United's Paul Pogba and Anthony Martial. AFTER A SLOW start to the season, Romelu Lukaku came good against Sunderland last Monday, hitting an impressive hat-trick amid a 3-0 win. At 23, he has 125 goals in his career — more than Cristiano Ronaldo, Wayne Rooney, Luis Suarez and Zlatan Ibrahimovic managed at that age. Yet Lukaku still has work to do before he can genuinely be considered in the top-tier of attackers in the world. Despite an impressive 28 goals in all competitions in 2015-16, his form was inconsistent at times. In his last 10 matches for Everton, he failed to find the back of the net once. Nevertheless, Lukaku has shown impressive commitment to Everton of late, reportedly turning down a move to Juventus prior to the closure of the most recent transfer window. And with five goals in his last two matches, Lukaku’s confidence is high, so expect Middlesbrough to be his latest victims this weekend. Chelsea and Liverpool have both started the season relatively well, and currently sit second and sixth in the table respectively. Despite respective recent hiccups against Swansea and Burnley, the two sides are expected to be strong contenders for a top-four spot come the end of the season. Moreover, with nine goals apiece, Chelsea and Liverpool are the joint-second Premier League top scorers so far, with only Man City (11) managing more. So given that they’re both potent in front of goal and seem fairly evenly matched, a score draw appears to be the most likely outcome tonight. With one point, three goals scored and eight conceded, Sunderland have made a typically woeful start to the season. Monday’s 3-0 loss to Everton suggested there are big problems at the club in the wake of Sam Allardyce’s departure. With that in mind, it’s hard to see them getting anything from an away trip to Tottenham. Furthermore, after a slow start, Spurs are starting to look impressive, as evidenced by last week’s 4-0 demolition of Stoke. It therefore seems difficult to envisage anything other than a convincing Tottenham win on Sunday. It hasn’t been the best of weeks for Man United, as a Manchester derby loss was followed by a Europa League defeat to Feyenoord. This Sunday’s trip to Watford won’t be easy either, though United have fared relatively well against the smaller teams so far. Prior to Saturday’s Manchester derby, they had conceded just once in the Premier League. But in contrast with City’s adventurous approach, expect Walter Mazzarri’s side to sit deep and allow United plenty of the ball, therefore it’s bound to be a tight game at Vicarage Road on Sunday. However, the Red Devils’ star quality should be enough to see them through, and as with all Jose Mourinho teams, they will be well organised, so don’t expect them to give much away at the back. It hasn’t been the best of starts to the season for reigning Premier League champions Leicester. The Foxes have picked up just four points, though they have also faced tough opposition early on in the form of Arsenal and Liverpool. Burnley at home, by contrast, should be beatable, particularly on the back of a morale-boosting 3-0 Champions League win in Bruges earlier this week. After 28 goals in all competitions last year, Jamie Vardy has made a decent start to this season, scoring two goals in four Premier League games. It would therefore be no surprise if the England international adds to his tally against Sean Dyche’s men on Saturday, with Burnley one of the weaker teams that Leicester have faced in the campaign so far. For more details on this weekend’s Premier League games, visit our score centre. Email “Man United to get back to winning ways and more Premier League bets”. Feedback on “Man United to get back to winning ways and more Premier League bets”.